Drive Through Bethlehem — Right Here in Daytona Beach! The car culture in Daytona Beach is famously strong. With a deep racing history and major attractions like Daytona International Speedway and the Daytona Turkey Run, cars are often associated with our oceanfront city. One unexpected way the car culture extends into daily life here? 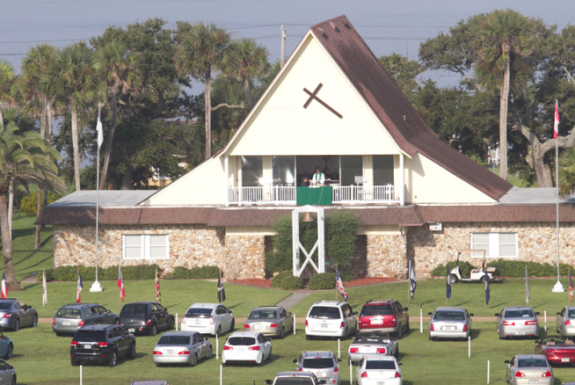 The Daytona Beach Drive-in Church! Originally a drive-in movie theater established in 1953, the space now serves the public with 55-minute services on Sundays at 8:30 and 10 a.m. The Disciples of Christ Church allows visitors to sit in their own cars and listen to the sermon by tuning in to an FM radio station. One of the best parts of the drive-in element is that, no matter the weather, you can listen to the sermon. An outdoor seating area is available for those seeking a little more shade, and indoor (and climate-controlled!) worship also takes place in the Friendship Hall at the center of the property. Visitors are encouraged to “come as you are” — no need to dress up, just be comfortable! During the holiday season, the church puts on a number of festive events, including the Drive-through Bethlehem. At the church’s annual reenactment, you can experience the sights and sounds of Christmas origins from the comfort of your car as the actors and live animals bring the story to life. The event will take place December 15, 16 and 17 from 6 to 8:30 p.m. Admission is free, but donations are accepted. And, earlier in the day on December 16, you and your family can enjoy an exhibition of the live nativity animals (pedestrians only — no cars!) from 3 to 5 p.m.
Additionally, the church hosts a Christmas Eve Evening Worship service with music at 7 p.m. If you are in the area for a winter getaway, consider attending one of these special events — it may just become your new favorite holiday tradition! Visit the Daytona Beach Drive-in Church on your next trip — located at 3140 South Atlantic Avenue, Daytona Beach Shores, FL 32118.